Map scale description: 2 1/2'' : 1 m.
This map appeared in "A New General Atlas Containing a Geographical and Historical Account of the World", published by Daniel Browne et al. in 1721. Its title runs along the top, with a dedication to Sir Peter Delme, Knight and Alderman, in cartouche at top left. The city arms and insignia, compass rose and scale bar feature at the foot of the plate. 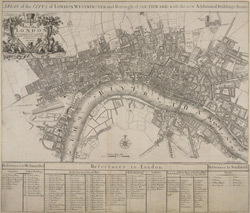 Reference tables to places in Westminster, London and Southwark appear in panels below the plan.